Though not designed as a shooting glove but rather for the world of work, the Ironclad glove is unsurpassed in quality, durability, non-slip surface, care needs and most of all sensitive touch. 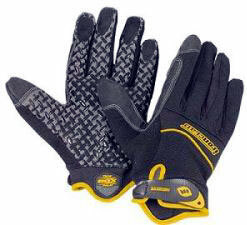 The gloves are made of breathable, directional and dexterous fabrics form fitted for all day use. A one-piece palm is employed for comfort and fit. There is a reinforced rubberized Arma Saddle and a terry cloth thumb. The glove closes at the wrist with a Velcro pull-tab. These gloves may be washed without fear shrinkage, stretching or hardening. Our squad and others at our club, Mitchell's Clay Target Center in Brooks, Oregon have been using this product for many months to assure that all claims regarding this superior product are indeed true. Our club mechanic uses them day-to-day as well and none of us has worn out a pair yet. In contrast, we'd have gone through at least two pair of others we've tried, which has a greater unit cost. Price per pair: $26.00 each with quantity discounts for bulk orders.